We made our own simple versions of these jars using empty ice cream containers, though any similar sized container would have been suitable. 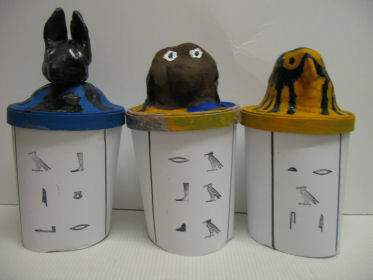 We used air-drying clay to shape the heads which formed the lids of the canopic jars. This was then left to dry for 24-48 hours. We then painted the lids in suitable colours. The body of the jar was covered in paper and decorated with hieroglyphics  we actually wrote our names in hieroglyphics for fun. 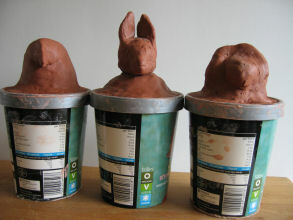 Variations on this project could include making the lid from papier mache instead of clay  scrunch up balls of paper to give a basic shape and then apply papier mache over this, allow to dry and then paint.